After a couple of days in Austria, we found out that although we were close to Germany, there were absolutely NO sausages or anything remotely shaped like a hog dog near us. Perhaps our assumptions of “sausages were everywhere” had done us a disservice. No worries. Our train into the Munich station nicely provided us with some on-the-go sausages. Crispy on the outside, juicy and fatty on the inside with a smoky finish. I noticed that sausage sellers always were able to keep the skin nice and crispy without popping or tearing it while cooking, and I was wondering why I was unable to do the same, back home on my stove. There’s an entire culture and method to sausage making (people have subsequently based their entire careers on it. Awesome). Exploration of the humble sausage is necessary, in my view, to not only make a delicious sausage, but to enjoy one to full effect. A country of red, white, and...chicken cilantro. The grind of your meat is highly important when making and eating sausage. When we think about a spectrum how how finely or coarsely your meat can potentially be ground; at one end, we have the paste-like consistency of hummus, and the other…not at all, like a steak. The former would be somewhat gross, and the latter would not be a sausage. Sausages that have a perfect grind usually have a nice “individualized” texture (uniform, but distinguishable), but not so “individual” to the point of graininess. True, there is a degree of binding in the sausage, but it should only serve to deliver the sausage meat as a whole, and yet, still provide a distinguished texture. Not grinding your sausage meat well enough results in large chunks. If I wanted large chunks, I would have gone for a steak, not a sausage. There are a variety of methods to bind sausage meat. The most natural, and perhaps the most multi-purposed and flavorful, is the use of salt. 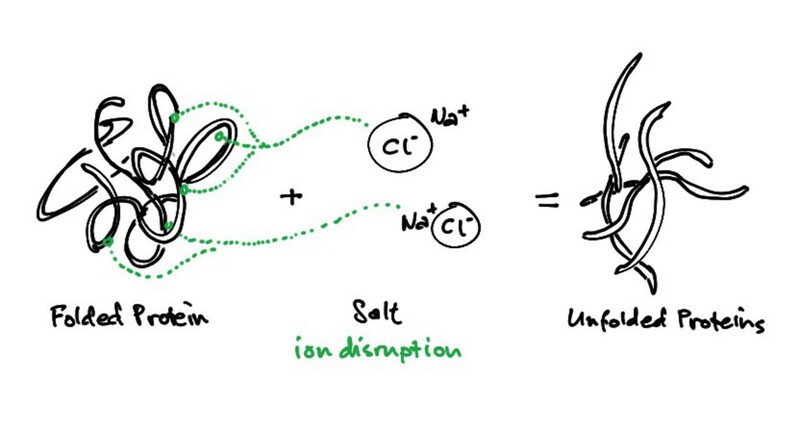 High salt concentrations denature (opens) protein filaments and causes them to re-cross-link. Cross-linking essentially means “entanglement” of protein fibers, and entanglement causes meat to stick together. Of course, this takes time. You can’t salt a bowl of meat and just watch it shrivel up and become all cross-linked in a matter of minutes. Salt also has the dual effect of curing the meat, inhibiting growth of harmful microbes, and nicely keeps spoilage at bay. I can’t think of a more useful tool. 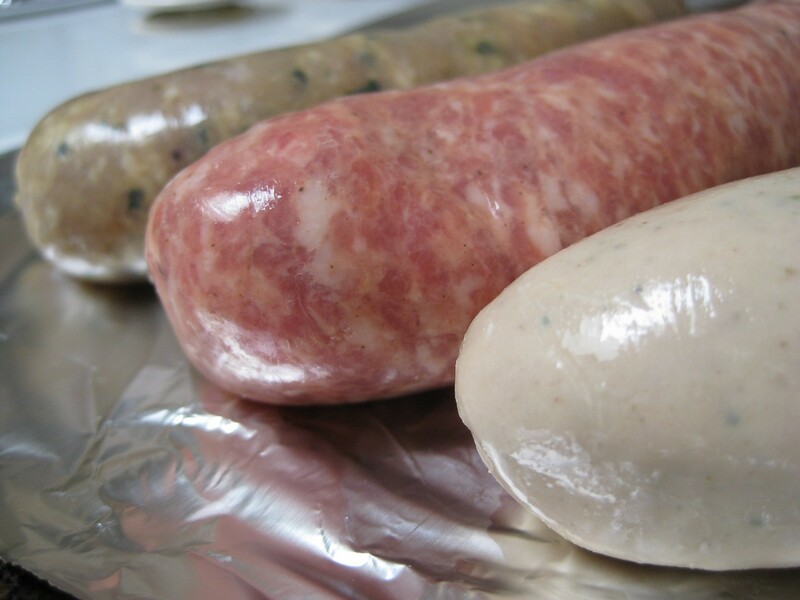 Binding sausage meat by way of artificial ingredients can entail the use of lactose, vegetable proteins, sodium caseinate, soy protein isolate, wheat gluten ,or soy protein concentrate, (what a mouthful of chemistry) in order to stabilize the structure of the meat by increasing its water binding capacity. This prevents a crumbly texture. Other people use breadcrumbs, or rusk, but this simply absorbs the moisture lost from the meat, which actually isn’t a terrible idea. For me, I would just use kosher salt. No funky chemicals, no weird chemical aftertastes, and it seasons the meat, to boot. Not only that, according to the Food & Agriculture Organization of the United Nations, the water binding capacity of meats increase as the concentration of salt increases as well. That = juicier sausages. Fat to protein ratio . We’ve all heard of 95/5, or 80/20 or 50/50; all these numbers being tossed around in the world of sausage making. They’re essentially the ratio of lean protein to fat. Obviously 95/5’s gonna need some serious flavoring going on, 80/20 is a fairly solid bet, and 50/50 can be a bit too greasy. What’s the deal with the type of meat, and the type of fat used in sausages? One of the more particular characteristics of the meat that we use in sausages is related to how well the meat can bind water. United Nations Agriculture Organization has reported that bull, cow, and calf meats, especially chucks, as well as veal and lean pork trimmings all possess high water binding capacity and are excellent for the purposes of stuffing a sausage. Water binding capacity, in this case, keeps water within the muscle cells, not outside of them. This renders juicier sausage, and when talking about meats, juicier is always better. (Hence, the previous salting to increase water binding capacity). Also reported is that very recently slaughtered meat makes the absolute best sausage. The explanation lies in rigor mortis. Quick rundown of muscle action. (Figure 2). Binding. Myosin attaches to actin and moves the fibrils, resulting in muscle movement. Whenever you flex at the gym, this is what happens. ATP, a form of energy, binds to myosin, triggering the release of actin. The entire action is repeated. Bind, release, bind, release. When an animal is slaughtered, ATP cannot be replenished. 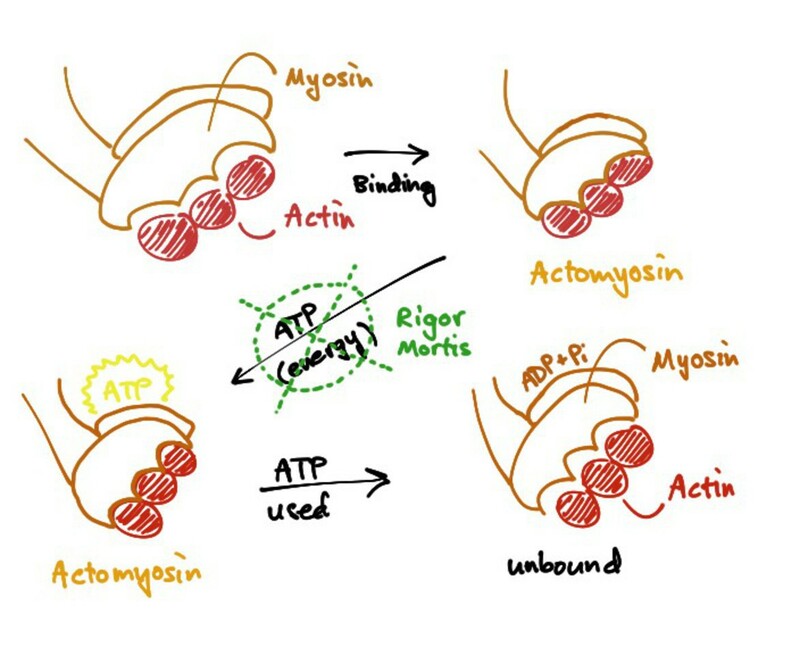 With no ATP, myosin cannot release from actin, and it remains complexed as actomyosin. Granted, we’re not crime scene investigators over here, but “pre-rigor” meat, as the U.N. calls it, contains small amounts of non-extractable actomyosins, which form when actin and myosin combine together. As the time increases from when the animal was slaughtered, actin and myosin begin to slowly combine, due to the lack of recycling ATP (a form of energy) that induces separation of myosin and actin. (Interesting tidbit: investigators can figure out how long someone has passed away, given the ratio of combined to non-combined). Salting it early on prevents the combination of actin and myosin, thereby bypassing poor meat emulsification and hard textures, which are the classic symptoms of high concentrations of actomyosin and the consequential rigor mortis. Animal casing. Usually the intestines of pork or beef. Sheep and lamb can also be used, but is definitely more rare. After removal and cleaning, they are stored in a salt-solution until used. May be subject to shrinking and/or breakage. Cellulose, fibrous casing. A bit more rigid, but sometimes indigestible by human standards. Some may even have to be removed. They are also less permeable than collagen casings, which may be a disadvantage when poaching in flavorful liquids. They are overstuffed. (binge theory). You force-fed your sausage too much. Too much heat, too quickly. Natural protein casings would tend to shrink faster than the protein inside. Your sausage had a heat stroke. Accidentally pricked. Your sausage lost in an fencing duel. Griffin, M., Casadio, R., Bergamini, C.M. 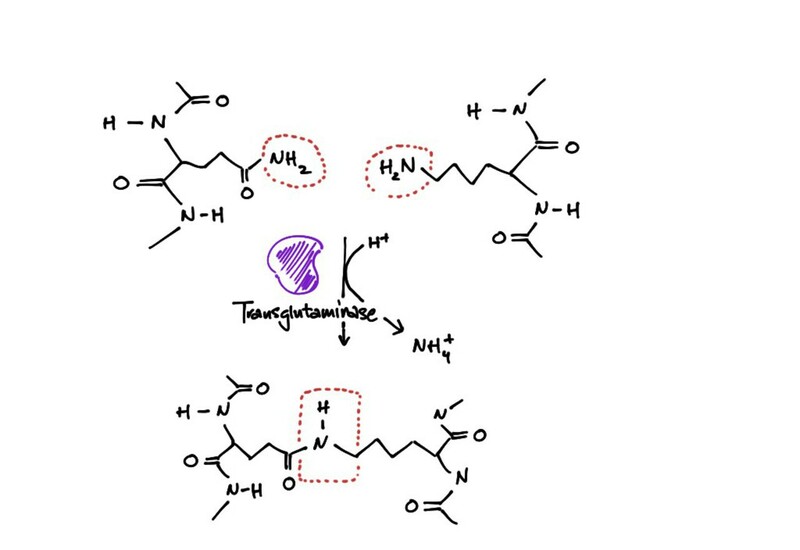 Transglutaminases: Nature’s biological glues. Biochem. J. 2002. 368: 377–396. Pouttu, P., Puolanne, E. A procedure to determine the water binding capacity of meat trimmings for cooked sausage formulations. Meat Sci. 2004. 66 (2): 329-34.